Years ago, if I'd had to pick a cookery show to watch, anything with Rick Stein would've been way down the list. I always used to think of him as 'the guy who only ever cooks fish' and whilst that's probably still quite true, having watched clips of his stuff on Saturday Kitchen, he's quite grown on me to the point that I have one of his books in my Amazon shopping basket. Of course, it's still unpurchased as there's always something else I'd rather buy, but at least I can pretend I'm being adventurous. The first time he hooked me into something was actually with a fish dish. But this one had samphire in it. For some reason I became a bit fixated on the idea of samphire - I'm really not sure why and I certainly don't remember what he cooked it with - but it was one of those things that I just had to have. Of course, living nowhere near the sea any more and what with it being seasonal local produce, the chance of getting some has never arisen in the intervening years. Until Friday. When I found myself with a generous handful of samphire and no clue what to do with it. I have no idea how long it keeps for so I felt bound to try and cook with it within a day or two. Ewan Mitchell, blogger at Tonight's Menu and creator of the Olympic Food Challenge, suggested a recipe that he recently made with Lemon Sole. That's another ingredient on my hit list before the end of the year, but living in land-locked Wiltshire fresh fish at short notice is a bit of a challenge at times. 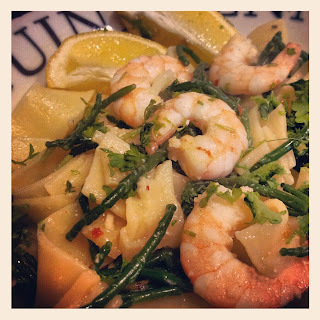 Not having a local fishmongers, I ended up settling on making something up with prawns based on a little bit of Googling about samphire. And actually, it wasn't all that bad. For the second day in a row, I feel quite proud that I've eaten something seasonal - even if the produce isn't exactly local with it. But at least it's not been imported thousands of miles on a freight plane. Samphire is touted as 'the asparagus of the sea' and it's supposed to have a really salty taste. I have to admit that I was expecting it to taste like a mouthful of seawater, but actually, it's not that salty. Or maybe my palate has just become accustomed to too much salt??? From the reading I did, people recommended to not salt the dish. In this case, I would highly recommend seasoning the pasta a little before finishing as the large, flat ribbons of pasta can be quite bland if picked up sans samphire. I normally only buy unsalted butter, but for this I'd probably go for slightly salted and then add lashings of pepper to the pasta before serving. To give flavour, I added some lazy chillies for some heat, garlic for flavour and then sprinkled the top with chopped parsley and served with lemon to squeeze over. I don't know if this is a sensible seasoning combination, but I liked it. The samphire has a slightly bitter tang to it so there seemed to be a good range in the dish - bitter, salty, sour, spicy and sweet from the prawns. If nobody else likes this dish, I know one person who would - my wonderful Grandma who would've been 83 today. There's nobody else I would've rather had dinner with tonight. Cook the pasta according to the package instructions. Drain and return to the pan, tossing in half of the butter and season with some black pepper. Keep warm by placing a lid over the saucepan. Wash the samphire and cook in boiling water for three minutes. Whilst the samphire is cooking, melt the butter in a frying pan over a medium heat and cook the garlic and prawns until they just start to turn pink and the garlic softens. Drain the samphire. Add the chilli, samphire and pasta and to the prawns and warm for a couple of minutes, ensuring everything is well combined. Serve sprinkled with the chopped parsley and lemon wedges. This looks lovely. I've never tried samphire but am intrigued. It's one of those things that Masterchef contestants always seem to use. I agree about Rick Stein. I was never in to him either until I bought his Far Eastern book which is excellent.